Happy Labor Day Weekend everyone! I brought these Three Ingredient Meatballs to my aunt's house yesterday and they were quite the hit so I thought I'd share the recipe! I'm filing these under "Quick Fix" because of the short prep time. Make sure you have equal parts Chili Sauce and Grape Jelly. I measured mine out to be sure so I ended up with about 8oz of each. Mix together in a bowl until smooth. 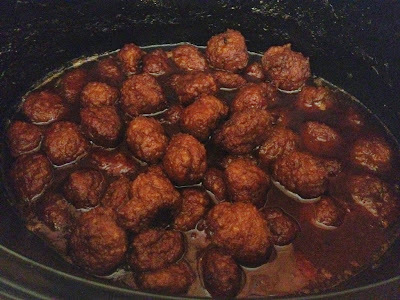 Add the Frozen Meatballs to your Crock Pot. Pour your sauce over the meatballs, stirring them to ensure all the meatballs are coated. Set your Crock Pot for 4 hours on High. Cover and let cook until heated all the way through. Stir occasionally. My meatballs only took about 3 hours so be sure to check on them every so often so the sauce doesn't burn! I know the combination of Chili Sauce and Grape Jelly sounds weird but the end product tastes like Sweet and Sour sauce!